For all you Kush lovers looking for that special flavor and hard hitting, pain relieving body buzz, this weeks recommendation for our best selling Marijuana Seeds is Sensi Seeds Skunk Kush. The Sensi Seed Bank is one of the oldest and most established Marijuana Seed companies, with its own seed distribution shop situated in the heart of ‘Red-Light’ Amsterdam. Producing Marijuana Seeds of the very highest quality has been the basic foundation of this breeder for well over 30 years. For the highest assured quality trust Sensi Seed Bank. Sensi Seeds High Quality Marijuana Seeds. Sensi Seeds Skunk Kush produces thick Afghani Skunk style nuggets that are dense, weighty and of the highest quality. Producing buds of the very highest quality is the standard for growers of Sensi Seeds, however, with the Sensi Seeds Skunk Kush, they have developed an incredible Marijuana plant, capable of producing a main cola with a structure composed of grape-like bunches of buds. 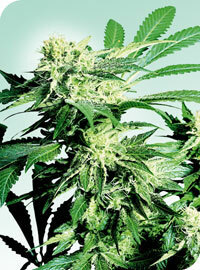 Sensi Seeds Skunk Kush Feminized Marijuana Seeds. The swollen calyxes produce solid, semi-open buds, which in turn produce a good weight, with a large surface area for the resin glands to develop. Some trichomes develop heads so bulbous that observant growers can actually watch them swell and change color from day to day as maturity approaches. When these high quality Marijuana Seeds are grown to their natural shape, or with just the lower branches removed, the main, central bud or Cola of the Sensi Seeds Skunk Kush can fill half the main stem on the plant. Across the phenotypes that this strain produces, musky, resinous Afghani aromas are complemented by a sharp citrus zest. The most sought after phenotype takes the fruity flavors to sensational new heights, producing lusciously sharp lemon and menthol flavors that linger on the palate, opening up the airways. Sensi Seeds Skunk Kush produces an extremely strong body-stone, with powerful pain relieving effects felt from the Afghani influence maintained within the females, while the Skunk Sativa throwbacks add a sizzling sideways counter-punch. A dreamy, giggly, red-eyed high can always be expected by purchasing Sensi Seeds Skunk Kush! Sensi Seeds Skunk Kush is just one of the many high quality strains available as Feminized Marijuana Seeds from Sensi Seed Bank, discover more by clicking below. Sensi Seeds Skunk Kush Marijuana Seeds.